Every Friday 3am Revelations give you our picks for some of the fantastic live shows happening in and around our city of Vancouver. What are you seeing this week? Let us know in the comments below. Why? The third iteration of the Let’s Hear It concert series features Harlequin Gold, Diamond Cafe, and Giorgi Holiday! Why? 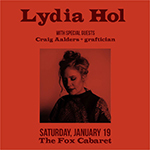 One of my favourite songwriters is gracing the Fox Cabaret stage at an early show on Saturday, and I, of course, am working. PLEASE go see her for me, it will be worth it! Why? SHAMELESS PLUG ALERT! We (Kirk & Christine) are hosting our monthly classic Simpsons Trivia night again. Come possibly win some awesome prizes and nerd out hard with us! Why? A great lineup of three local acts! Why? It’s been a grey couple days, so warm up inside the Rickshaw with some excellent bands. As I say every year, no one really cares about year-end best-of lists anymore. At best, you glance at them with a vague sense of disagreement before maybe complaining online, then completely forgetting about it. These awards take a look at this year in music and honours the deserving songs, albums, and artists in the form of randomly named award categories, as chosen by me (Kirk). And even though the awards may be a little glib (to say the least) these are legitimately some of my favourites of the year. Without further ado, and in no particular order, click through for the results!